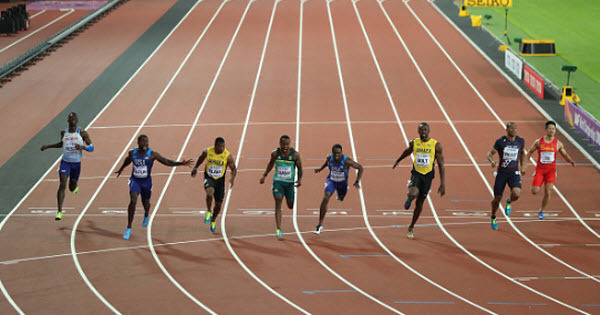 Athletics fans love statistics, and I’m no different, which is why it was so exciting to hear that the IAAF and Leeds Becket University were to collaborate on a biomechanics project at the recent World Championships, giving us some insight into what makes up a world class performance in athletics. As the Championships finished last weekend, the first initial reports were released for the men’s 100m and 10,000m, men’s discus final, and women’s pole vault final, which you can find here. The extended analysis will come in time, but the initial analysis does contain plenty of interesting bits of information. As my athletics knowledge is primarily limited to the sprints, that is where I’ll focus. The initial report itself does a great job of presenting the pertinent points, but I hope to add a little extra context where possible.